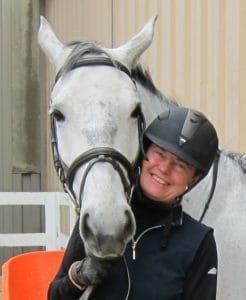 Dear Nicola, thank you for putting such a great program together to help me become a better, confident rider. I loved DRT2 it really complimented DRT 1. I really feel my posture has improved in this program. When I started DRT1, you gave what I needed at the time. Such as stretching out my hip flexors, abductors and piriformis. With DRT2, I could feel the benefits of my increased strength, to help accomplish those challenging moves. Thank you for being there too, when I had questions, that helped, and encouraged me. I do get comments now what a lovely rider I am now. This helps me build my self-esteem, as I only started riding a few years ago, and used to grip, and ride in a chair seat. And was very self-conscious. I hope to start riding dressage tests, as we progress. Thanks for mindset too, as it helps me build confidence. Thanks again Nicola ?Oh and thanks for the option of USB stick too, couldn’t do without it. 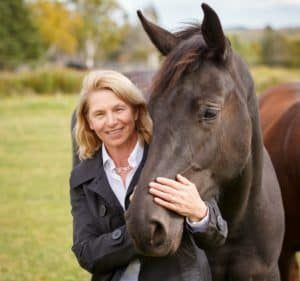 Hi Nicola, thank you very much for creating and sharing the DRT program with the equestrian world – horses and humans! I am one of those people who tries too hard to make things happen, which causes tension in myself and my horse. After twelve weeks in your program, I am able to release the tension after using my muscles, so I am doing much less, and my movements have become much more subtle and relaxed. My horse can finally “hear” my aides and has become much relaxed and responsive. 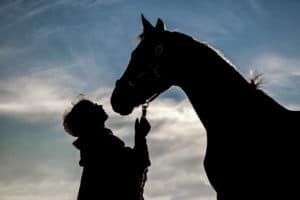 I have a long way to go as a rider, but I am “listening” more and struggling less – and so is my horse. The program is really well designed. It’s broken into very achievable segments that build on each other with stretching and riding homework that is easy to build into the day. 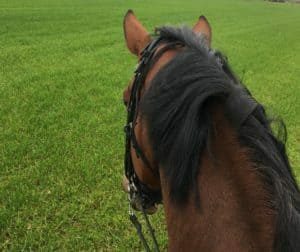 I love the length of the workouts, the variety of movements, the focus on muscles we use in riding, and the very genuine way in which the videos are presented. I look forward to my workouts with you! Thank you! I can’t wait for DRT 2. P.S. 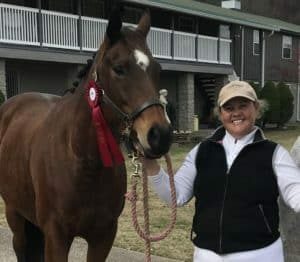 I am an eventer – but we can’t win events without awesome dressage scores! I am a 64 year old competitive barrel racer. Mother of 4 and grandmother to 8 boys! Fortunately for me they all live around me and we have great fun riding, swimming and playing all sorts of sports! Five years ago I suffered two head injuries falling from horses resulting in severe concussions. They left me with poor balance , dizziness and poor physical condition due to a 6 month layoff of anything jarring. Fortunately for me I was still able to ride after 3 months be it all very quietly. It has taken me this long to attempt any sort of workout program and when a friend posted it on FB I decided this was just the thing for me. Having completed your first program of DRT I can`t wait for the 2nd one. Your program was easy to follow and short and sweet! 20 minutes was easy to fit into the day somewhere. I loved the stretching exercises afterward and the encouraging videos! I live in rainy BC Canada where it is just starting to be spring now so I loved watching you outside in the sun! I did most of my workouts outside in my porch because fancy equipment wasn`t necessary! I am happy to report that my riding has returned to its previous level and the paychecks are a strong indication of that! I have found the holes in my fitness l and hope to soon have mastered the kneeling on the swiss ball while performing the arm exercises, Right now I am only good for a few. Balance is key for both that and riding so thank you for introducing me to those moves. While waiting for the next lot of exercises I am making good use of the online gym doing strength , core and yoga. Thank you for the wonderful website and programs. Both you and Ben are inspiring and kind with your encouragement! Looking forward to the next phase! 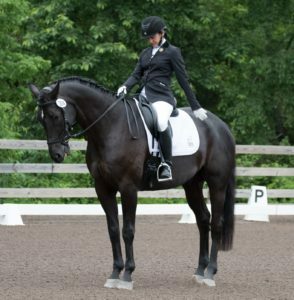 The DRT program is fabulous for any rider at any level. It has helped me to target certain muscle groups and hone in on areas where I am weak. It has also helped me to develop the ever elusive “feel” my trainer always talks about. Not only do I feel good but my horse does as well. He is my “mirror” after all. I will definitely recommend this program to other riders and continue with it for the future. Your workouts were exactly what I needed to get back into activity. It was the perfect 12 weeks to build myself back up, and I enjoyed every single workout…so thank you. From a professional standpoint (I’m a Certified Athletic Trainer) I liked your exercise selection and thought they were appropriate to what you were trying to achieve for your riders. I think your progression was very well planned, and each exercise was geared towards moving into the next level. I am very much interested in DRT2, although I may wait a few months just to save up for it. Thank you again… I’ve saved every workout and look forward to continuing the workouts and really getting into the homework. We’ll be chatting again when I’m ready for DRT2! After finishing DRT1 I am pleasantly surprised at how I have been able to do all the exercises. I feel stronger, more balanced and fitter and my horse is definitely noticing the change! At my age(60) I need to work more consciously at staying fit and this program is ideal. I love all the aspects, core, strength and yoga and the way it blends in with riding. The only thing I haven’t mastered is balancing on the Swiss ball. I can do a few seconds on all fours but I’m not sure if I’ll ever be kneeling on the ball. I will keep persevering because it is so much fun! Excellent programme, really impressed how it targeted all the areas that needed a great deal of attention! Core stability and strength work I had done before and appreciated the value of (and had even on occasion mastered) but I had not considered suppleness for humans as an essential requirement. I very much enjoyed the yoga routines, they really helped open up my hips, release tightness in my back and by relaxing, deepen my seat. I also really enjoyed the mindfulness side of things, a useful life tool all around. 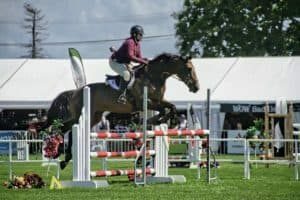 With very many thanks from an ageing human and arthritic mare hoping to keep our adrenalin and fun levels up for many years to come, I am sure your course has helped! Absolutely loved both DRT 1 and DRT 2. The three, 20-minute weekly workouts were perfect for my busy schedule. I am 60 years old and had a hip replacement several years ago. The program has helped my overall strength and flexibility. Most impressive is the change in my core strength which has really helped my position. Hope there is a DRT 3 coming soon and In the meantime, I will be repeating DRT2! 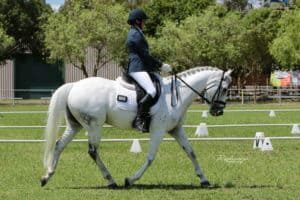 Hi Nicola, I just completed your program and the end of the 12 weeks coincided with me attending a clinic at the Queensland State Equestrian Centre for 3 days under instruction from Grand Prix Level Dressage Instructors. Over 12 weeks, my posture and riding improved, my confidence was boosted and I lost 7kg as an added bonus. I am 55 years old and want to be riding for as long as possible. I feel the best I have felt for years and I would highly recommend this program to anyone looking to improve their riding and to stay fit to ride. The DRT training program is amazing! As with most people, my biggest issue is time. Becoming a better rider means more time in the saddle, attending clinics, taking lessons, reading books, watching youtube and most importantly getting your body conditioned for riding. However, I always felt working out was taking away from the time I had to learn more about riding. This program is without a doubt the most beneficial thing I have done for my riding. To begin with, listening to Nicola and her suggestions both calm me and give me focus for my riding goals on any given day. I love the format and that there are three different focus areas for each week. 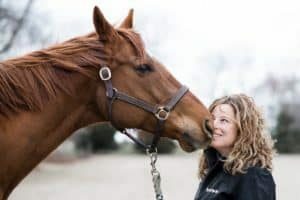 Nicola does a wonderful job at explaining the movements and benefits so they transfer immediately over to your riding. I can also choose a specific workout depending on my day. If I am riding 2-3 horses that day, I will I complete a Yoga Strength workout to make sure I am nice and relaxed for my horses. From this example, you can see that there is some flexibility within the program to suit specific riding needs. I really could go on forever about the benefits of this program. What I can say, is I’m gearing up for the DRT2 program and if you’re reading this, I highly recommend you try this fabulous 12 week program. You will see the changes in your riding immediately. Hi Nicola, I really enjoyed this 12 weeks program and I will suggest it to everybody who wants to improve their core strength. I finally understood what means to be in balance with the horse. I am happy and I see how happy my horse is whilst feeling how do I improve my riding. This course was great. Thank you Nicola! Hi Nicola, Congratulations on putting together a rider fitness program that is for EVERYONE – all fitness levels, all ages, all riding levels. 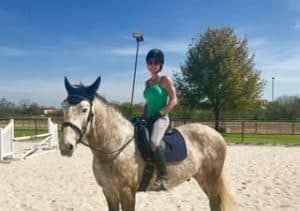 I am in my late 40s and have been riding since I was 7, but I have never felt as stable, confident and strong as I do now. It took me a few months to take the plunge and sign up, but I could not be happier that I did. 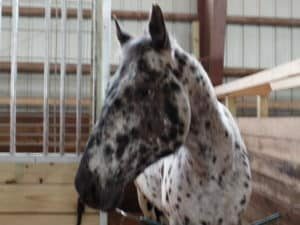 I have decided to repeat phase 2 of DRT because my horse has been injured for several weeks now. However, I have been able to maintain my strength and fitness off the horse and will be ready to get back to it when he is sound again. This has never happened before! In the past, BOTH of us would have had to start all over again. With DRT, I know when it’s time to get back on, he may be fresh and spooky, but I will be centred, strong and fit – ready for it if the ‘horse eating monsters’ strike. I have never stuck to a fitness program as I have to DRT. 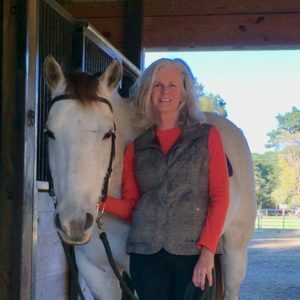 I am so grateful for your gentle, relatable and realistic approach to rider fitness. I love that it’s real and that sometimes your horses and puppies want to do the workouts with us! I will continue to repeat workouts as much as I need to and then move on to DRT2 later on this year. Thank you again for being there with me in my lounge room each morning to help me realise that I actually can do this! The DRT program is one of the best things I have signed up for. I’ve been looking for a positive progressive & fun rider training program for years. I am so glad I found you Nicola! Spending 3 x 20 minute sessions with you each week has transformed my body. I am stronger, more physically aware & capable, less aches & pains but more importantly my riding has improved. As an over-60’er who came back to riding after a 40-year absence which included years and years of hamstring- and hip-tightening running, I can attest that DRT has helped loosened things up as well as make me more aware of body position and core effectiveness. There is a difference between being personally-fit and rider-fit! The 20-minute segments are easy to fit into busy schedules. Plus, I love the fact that the program is shot outdoors with charming interruptions and occasional goofs that make it more friendly and real. I purchased the USB version so that I don’t have to worry about my internet connection and can go back again and again for the weeks I really liked or found challenging. Thank you Nicola! Hi Nicola, I am loving this program!! Attached is a picture of my horse Chevy and myself from yesterday. 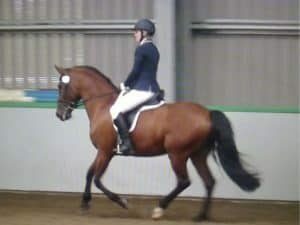 We competed in the flat division at a series of hunter schooling shows over the winter and ended up Circuit Champion. He is young and I have been doing all the training myself and this program has been wonderful for improving my balance and feel. As a 54 year old rider who spends my days in front of a computer, this program is exactly what I needed to counter all that sitting. I love the fact that I can download the videos and do them from anywhere. I travel a great deal for work and have been able to do the workouts in my hotel room. I will definitely sign up for DRT2 when available and will continue on with the program. Currently I am just starting week 9 due to work and an injury and that is the other thing I love about this program. I can do it at the pace that works for me and still see improvements with my riding! I am 110% pleased with the DRT1 program…. and plan to continue on to DRT2 at a later date. I am very impressed with the variety, challenge, balance, rider relevance and progression of exercises offered in each week of DRT1… not to mention the motivation and encouragement provided in your weekly emails as well as in your FB posts. THANK YOU, Nicola… yours is the absolute BEST fitness program I’ve ever participated in? I’m a 53 yr old rider who has been riding for 12 yrs. My horse is an 18 yr old Cheval Canadian gelding (a rare breed). He has owned me for 10 yrs. 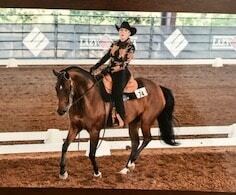 I took two years off from riding, so my daughter could train and compete toward earning her USDF bronze medal. Now that she is off to college, its My Turn! I was feeling frustrated in my riding. I wasn’t putting in enough time in the saddle and wasn’t having the successes I was hoping to have. I joined a gym, worked with personal fitness trainers, only to find neither was helpful with improving my riding. 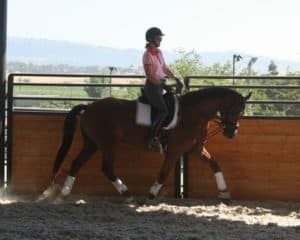 When I learning about DRT on Facebook, I was impressed to find a work-out program that is suited for the dressage rider. The DRT workouts are broken out into perfect segments Core, Yoga and Fitness. The lengths are manageable for fitting into a busy schedule, and best of all you can do them at home! I like that there was always an alternate method of doing an exercise if one was too difficult at the time. After many years, at the same barn, working with the same trainer, I packed up and moved my horse in February to a new barn, and got a new trainer. I’m putting lots of time in the saddle now. I ride every weekday morning, and making small improvements each week. 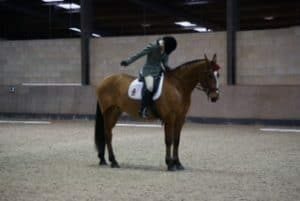 Having ‘eyes on the ground’, my new trainer has been crucial in correcting my seat, position and my building confidence in the extended canter, which is my biggest fear. Boy, is it ever hard to bring a freight-train extended canter, down the long side, to a working canter 15 meter circle without going Splat and breaking gait!! I will be competing in my first rated show in May. My biggest fear will be stage fright. I may have to knock back a strong martini before I enter at A and halt at X. Thank you Nicola for creating a wonderful program. Yes I loved the dressage rider training program. Even after a few sessions, I noticed my balance and strength improved in the saddle. The biggest ‘hurrah’ was when my trainer asked after just a couple weeks what I had been doing differently!! As she noticed my core and balance strength improved — I am glad I bought the USB as well so I can repeat these exercises often! 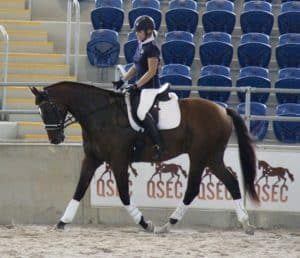 Thank you Nicola for offering this great training program for us dressage riders, though I think it would benefit anyone wanting to get fit and more supple. I have to admit when I first saw it I wasn’t sure if I wanted to spend the money as I hadn’t heard of DRT before. However, I was in both a physical and mental slump after losing two of my best friends and my older dog in December. I needed something to get me back into shape and ready for showing again so decided to give it a go. When I first started your course I was so pleasantly surprised that apart from the physical training you also offer so many calming tips too. I didn’t always find it easy, (I’m in my 50’s), but I enjoyed the variety of exercises and yoga and it felt good when gradually I realized I was getting stronger and fitter. 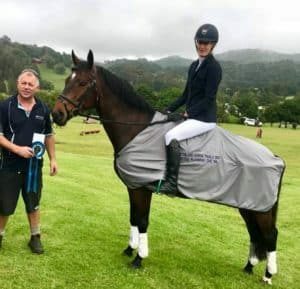 Then there is the wonderful healthy recipes and I loved the video of your talk at the NZ Dressage symposium which was very inspirational and started me to really think about the food I was eating. I really like your holistic approach to fitness and riding. 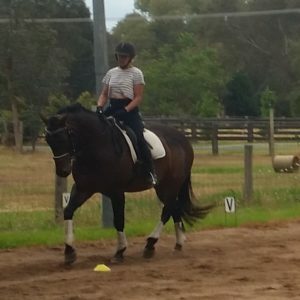 Since starting your course I am now both physically and mentally in a better place, have lost weight and ready to show my 6 yr old Hanoverian gelding in 2 weeks time. 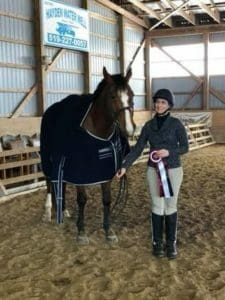 I would and have already recommended your course to friends and anyone wanting to get back in shape and improve their riding at the same time. and I am looking forward to continuing your online series. Photo is of myself and my horse Leonidas. Thank you. Nicola, I will wholeheartedly promote your program to all. I have benefitted greatly from it. The photo I will forward to you I have full rights copyrights, it is from my ride at the WDAA Worlds. Dear Nicola, I have really enjoyed the DRT2 program. I have found the 20 minute workout great to fit into a busy schedule and have been surprised by how much my strength, flexibility and balance have improved over the 12 weeks. 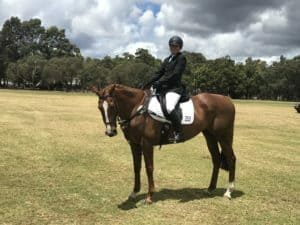 I feel more secure in the saddle when riding my big moving Warmblood and quick moving TB and feel motivated to keep improving my fitness to be a better rider for my horses. Thanks so much for a great program – I’m looking forward to DRT3! Hi Nicola, I have really enjoyed the DRT program, I managed to complete it and keep up, which was a real surprise to me, having had a hip replacement 3 years ago, and so my flexibility is not so great! 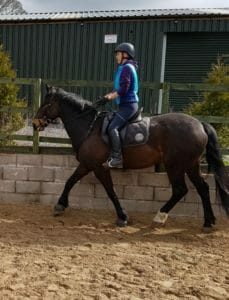 I’ve been suprised with my strength and stamina, and feel that I’m much better connected to my horse now, despite not being able to do very much of the sitting trot work, which is still a bit painful, but working on it! I also managed to lose 15kg in the 12 weeks, as I changed my diet as well at the same time, so feeling like a different person now! I intend to do the whole 12 weeks again, just to cement it all into place, and see how I have changed since the first round. I really needed DRT, as I have a young horse that I’ll be beginning to ride in the near future, and really needed to improve my core strength for that, as he has a big movement! My horse Freeway and I are developing a much better partnership now that I’m not collapsing all over him, so he sends his thanks too! Dear Nicola, I joined the DRT1 programme as I was always being told by my instructor that I needed more leg strength. The programme has given me so much more than that! The routines are just the right length and fit seamlessly into my week. I have gained core strength and generally feel fitter. My riding has improved beyond belief and I am sure my beautiful horse Max has gained from it too as I am more balanced in my seat. The sessions build in difficulty at just the right pace and continue to challenge me. I have enjoyed the whole experience and whilst the riding homework has been difficult due to the awful weather we’ve had I will make sure that I continue with over the coming months. I am certain that I am a better rider now than when I started and will definitely be signing up for DRT2. I have the chance to be a bit back and starting week 11! Not yet the end! At the age of 47, I had never felt the need so far to do some workout to improve my fitness. Than I had some back pains that made me think about how I was aging. We are only at the half of our live! I made some researches on youtube to find some yoga for riders after reading an article about a french professionnal rider of 62′ that said that he was even fitter than in his 40′ after beginning yoga and changing what he ate (I may link the article below for french speakers if you want?). I must say that Nicola’s programs have changed my life. I was working out for riding but finally working out will stay for all my life and I realised how the body may change and improve with not so much efforts. I don’t have back issues anymore. I realised how a healthy body (as I didn’t have the feeling to be so down) can improve the mind and help to be more positive in your daily life. Maybe it is obvious for a lot of people but I only experienced this thanks to DRT and DRT2. I am so happy I met you Nicola Smith! You changed my life? I also need to thank the DRT community that is so kind and supportive. How could I imagine from Belgium doing a gym program from New Zealand with people from the entire world! When can we meet in NZ?? I just wanted to say thank you and tell you how your program has helped me. I tried lots of programs before DRT, but none of them were specifically for equestrians and they didn’t make that much of a difference in my riding. The 2 months leading up to DRT I was riding a Grand Prix schoolmaster competing in the Children’s FEI in Wellington, FL. 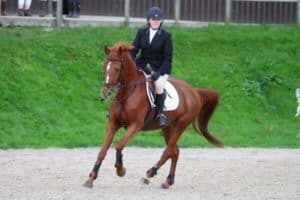 I had trouble sitting the trot at times, I was having a hard time keeping my shoulders back and chest open, and my lower leg would either flop or brace. I was only in Wellington for 8 weeks and I started DRT the week before I left. When I got back home there weren’t any horses for me to ride. My trainer goes to Wellington for 6 months and doesn’t return to her farm in VT until May, so there are several months where I only ride a couple times a month. I was doing all the workouts, but hadn’t been able see all the work benefit my riding until last week. I was shocked at the huge improvement in my riding. Sitting the trot was actually easy and the trainer only had to remind me once to keep my shoulders back! I was so much more balanced and elastic. It was so much easier to keep the horse balanced, because I wasn’t losing my balance. When doing the flying changes I stayed centered and my aids were quiet! I am so thrilled with the progress! Thank you so much Nicola! I can’t wait for DRT2! I was first attracted to DRT as the exercises I saw advertised were many of the same exercises I was doing at physio for a lumbar compression fracture. 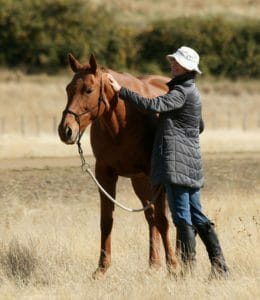 At the time I had only started the physio because I woke up one day and just decided I was sick of being in constant pain, and it was starting to put me off riding, so DRT looked like it had the potential to help me recover my mobility. At the time I was also suddenly noticing how many of my friends that I rode with in my teens, twenties and thirties were no longer riding. I noticed how many were dropping off through bad falls and injury. I thought many of them looked fit, and I thought that I was fit! I wasn’t hugely fat, but sure I’m a solid unit and always have been. I have six horses (four in work) and a rural holding to look after, so I’m always lifting hay bales, picking up manure, fixing fences and chopping wood. I’m a mother and wife so cook, clean etc. Oh, and I work full time in an executive role, with lots of air and ground travel to meetings around the country, and lots of desk time (although I do have a standing desk). Boy was I wrong about my fitness. DRT has not only improved my stability when things go awry in the saddle, but my endurance is improved exponentially, and um, well, this is embarrassing but no longer worry if I laugh or sneeze with a full bladder. Not only do I go home after a weekend show jumping still feeling bright, but I managed seven days at Horse of the Year show, with three horses stabled 500 meters away from our truck (i.e. its a lot of walking!) and came home not feeling like I needed another week off to recover. And jumped big tracks every day for five days. To anyone who thinks it is just for dressage riders and happy hackers, then think again. 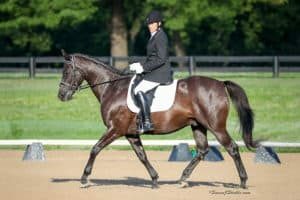 Yes at first the focus on long dressage legs may seem unhelpful, but stick with it and you will be more than ready for a George Morris no stirrups session. And don’t be put off because some part or other of you is broken. Two bad knees, tennis elbow, a lumbar compression fracture and two separate cervical fractures and I’ve clocked up 28 consecutive weeks. I achieved my personal best last week, no ribbons but I did what I never thought would be possible by riding the biggest, most complicated technical track of my life on the most difficult horse I have ever owned. A couple of rails sure, but I nailed every turn and every related line and the treble combination. I was only able to achieve that because I was my best self, physically and mentally, and I wouldn’t have got there without DRT. I am now addicted to this programme, so there needs to be a DRT3 before I get bored with repeating DRT1 and DRT2. I have finally finished DRT 1 and all I can say is ‘Wow!’ it’s fantastic. 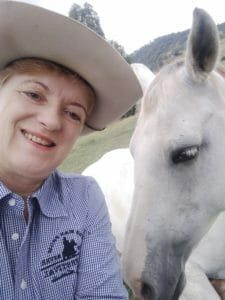 I am 61 years old, have had both my hips replaced and have owned horses most of my life with a special interest in dressage. This programme has made me feel 20. I don’t think my balance has ever been better. I am so much stronger, more supple and confident. I can feel how much more relaxed I am and that horrible twist I have in my seat, which makes me sit unevenly, has almost gone completely. Unfortunately, my horse was out of action for quite a lot of the programme and that’s why I’m just feeling the benefits to my riding now. How often do you find your riding has actually improved when you haven’t even been riding!! But because of this, I’m going to go back and repeat from week 5 again, this time with the ridden exercises and sitting trot. I will definitely be looking to do DRT2 when my horse and I are fully up to par. 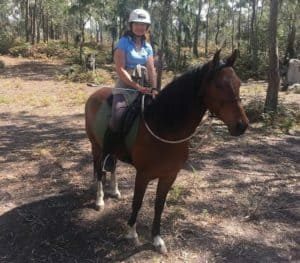 The DRT program has greatly enhanced my fitness as a rider and has enabled me to show my big horse off to his best advantage. I recommend this program to all of my students as Nicola does a great job of explaining rider biomechanics throughout her workouts making them relevant to our sport. 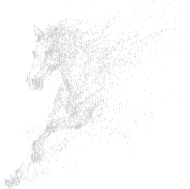 DRT1 and DRT2 are fantastic programs designed especially for horse lovers! My riding has improved and the credit goes to both programs because each session was a building block and I was able to improve each time! I believe Nicola has done a stellar job in designing, developing and demonstrating each class for us! 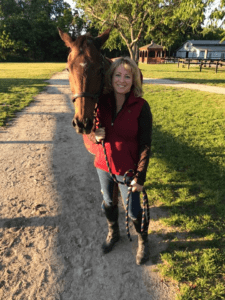 She is brilliant utilizing her horse knowledge with her education and love of exercise. As a result, I do have a stronger core. All thanks to Nicola’s genius in producing both programs, DRT1 and DRT2! I have become stronger, more flexible and confident in my position and in my riding abilities. Best part of all, my horse partner recognizes my efforts and appreciates it! If I can do it then you can too! I promise you that your joy and love for riding will blossom even more! The enjoy factor was high and the effort factor depended on the day. After having completed both DRT 1 and 2 I slacked off entirely for a few months… no riding, no morning exercise which, naturally, resulted in softer core and less energy. I am now starting DRT again, going more slowly and doing each section twice before moving on. I am amazed at the depth of the programme that I completely missed during the first time I went through. Congratulations for developing such a seemingly simple but highly challenging programme. I am now more fit and flexible, have better balance and now rarely lose my left stirrup and tip off the right. Horse travels better too. Unfortunately, this isn’t the fountain of youth but as an older rider I am much more able than I was. Thank you so much from both horse and me. I am thrilled to have completed DRT1 + DRT2. Jeeves is going through many positive changes at the moment & my trainer tells me that we are on the brink of everything clicking into place like dominoes flipping. So I am really looking forward to that. That said we have made huge strides forward since starting DRT 1 & completing DRT 2. My confidence has increased hugely & therefore his too. This is because the courses have provided me with the balance & strength & understanding of the importance of presence whilst riding. I am doing things with Jeeves that I would never have been brave enough to do 6 months ago. I am no longer worried if he spooks I can deal with it. If he tried it on which he does at times I can deal with it. We have become one after 3 & 1/2 years of owning him. He arrived with me as a rising 5 year old, he is 16 hands, I am only 5ft 4ins, the wrong side of 50 on under 9 stone. It has been a bumpy road at times but the DRT courses have been our saviour, thank you so much Nicola. I have decided that I will repeat DRT 2 & have started again already. This is because during most of the course my Mum was in hospital which has meant that I have been short of time & sleep & therefore feel I may not have got as much from DRT 2 as perhaps I might have done otherwise. So I am really looking forward to my onward journey with DRT2 & looking forward to reaping yet more results from re-doing the course. All the best to all those who decide to do the course it is SO worth it. I love this program for so many reasons. It was always available at my convenience and the instructor is enjoyable to “be” with – encouraging, intelligent, knowledgeable, funny and very real. Not getting upset when the dog or horse chooses to walk on her set is so engaging. My riding has improved significantly. More balance and stability and all the wonderful things that it does for my horse. Yesterday my hand grazed my belly and I had to do a double check. No more jelly! I’m not saying it can’t improve, but I was surprised at how much my muscle tone had changed. Thank you! I highly recommend the DRT2 Program. Having completed DRT1, I confess I was sceptical as to how much more the DRT2 Program could deliver … but as I had found DRT1 really effective, I decided to give it a try. I was really impressed with the way the course continually challenged me, without overwhelming me. The formal course ‘finished’ a couple of weeks ago, however I am repeating Week 10 (again – until I am happy I have it ‘right’). Just this evening I successfully knelt on the Swiss Ball and ’wood chopped’ with a dumbbell! – I would never have believed I could do this when I started. The additional strength, balance, coordination and body awareness the DRT2 course has given me is worth every cent – and every groan 🙂 And importantly, it has translated into enhanced confidence both in and out of the saddle. Thank you Nicola – I wish you continued success and if there is a DRT3, I’ll be signing up! I love the DRT2 program! I turned 47 this year and feel better than I have in a long time thanks to Nicola and her guidance. I truly believe that staying fit and active keeps us healthy and makes us better riders. The workouts focus on many areas that we need to be strong and balanced in the saddle. The “extras” that she provides with yoga, mediation, nutrition and inspiration help to remind me that even though my aspirations may not be to ride at the upper levels I am still an equestrian athlete and need to treat myself as such and to not let other areas of my life overshadow my passion. She really does take a holistic approach to health and wellness. As a busy mom of 3, I work full time and have 4 dogs and 3 horses. My time is limited on most days. The DRT1 and DRT2 workouts are designed to help me stay on track even on my busiest days as they are short enough that I can usually fit one in at some point. With everything being online I can make the workouts fit my schedule. Also, if I ever hit a road block Nicola is very accessible and responds quickly. If you are looking for a program to get you fit and give you that extra edge with your riding, this is it! Best of luck! 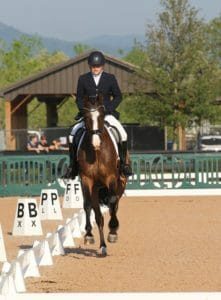 Not too long ago when I began studying Dressage and began asking my horse for certain postures and yields with not-so-perfect responses, I realized I was not doing in my body what I was asking to do in his. I set out on a path to find a course that would teach me how to find relaxation, flexibility, strength, and balance in my body so that Dak and I could move in harmony. I came across DRT 1 on Facebook and it sounded like the perfect course. Well. It turned out to be just that! Three 20-minute workouts weekly that address the areas of yoga, core, and strength was perfect for helping me meet my goals. 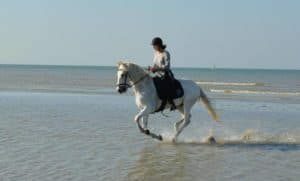 The routines vary in exercises and intensity so I didn’t get bored doing the same exercises, they are specific to riding with explanations of how they apply to riding, and they are progressive so you are improving without even realizing it until you reach the end and are doing exercises you never thought possible! I highly recommend DRT1. 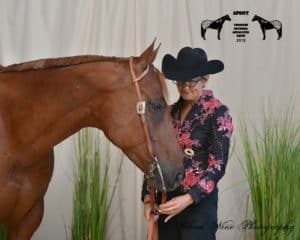 It will change your riding in amazing ways and your horse will begin to move more freely underneath you because you have learned to get out of his way and move with him. Loved this course! I’m now a fitness fanatic and and the core of my motivation is becoming a better rider for Dak. I am quite strong in the core but those workouts remind me to activate those muscles more. 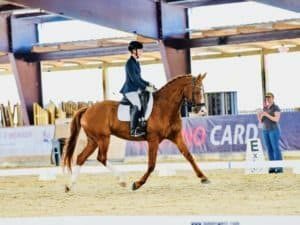 I am determined to get more flexible so I can allow my horse to move more freely in dressage once my dressage is a bit better we can move up to 1* in the Autumn season. 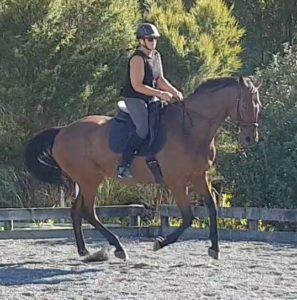 I love the variety and the flexibility of the workouts as been away a lot and have a 3 day next week so schedule with daughters horses (she just 2nd in CIC1* at Rotorua on weekend). So, all in all, I find the workouts achievable, varied and well presented. Really enjoy them and will be looking to do more next year. As a birthday present to myself I accessed DRT level 1 in May this year and began my journey of discovering my core and balance (well, lack of ). As soon as DRT 1 finished, I signed up for DRT 2 because I wanted to keep going with Nicola’s exercises. While going through DRT2, I bought myself a green 14hh gypsy cob cross and we’ve been schooling together in our makeshift arena ever since. When I do my exercises before I ride I know I am riding better that day. My core is switched on and I can communicate my aids more precisely, which helps my pony a lot:). One thing I really like about Nicola’s style of presentation is that she explains what we’re doing and why we’re doing it as we’re doing the exercise. I can hear her voice as I’m riding – strengthening my sides, keeping a still but dynamic seat. Today my pony and I did our first leg yields. I am so impressed with DRT 2. And I think my wee pony appreciates it too! Many thanks to Nicola Smith for creating this program! 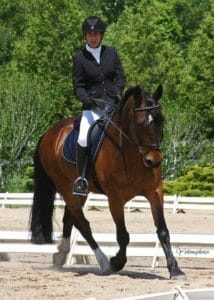 We all need help with maintaining our balance in the saddle, and this program was the ticket for me! I thought I was fit since I ride up to 4 horses a day professionally. The program refined my balance tremendously and I tell all of my clients about it. Cheers! Hi Nicola, Just letting you know what an amazing impact DRT has had on my body and my riding. I’ve just finished the three-months and am continuing Week 12 until I master that ball! 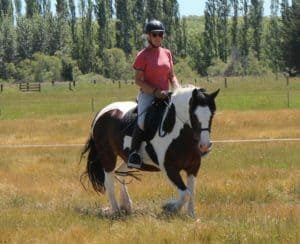 I’ve been learning dressage for 18 months now and, being in my mid-fifties, struggled with balance due to poor core strength and flexibility due to lack of use. I currently am just starting to ride at Novice. 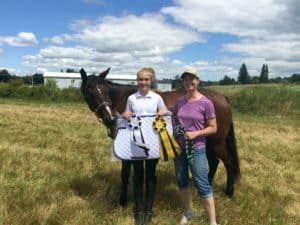 At about halfway through I noticed a difference in my strength and balance when out at a Competition: being on a new horse at a new place had both of us a bit unsure. However, I found I was so much more confident as I could guide my horse around with my new-found balance. 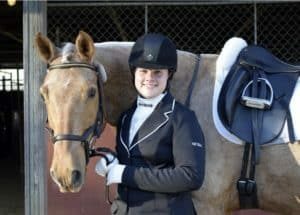 My trainer noticed the difference in my riding and can tell when I’ve done a session on the day of a lesson as she says my body looks switched on. My stirrups have gone down two holes and I can touch my toes. I also have a waistline again and am overall more toned. I have found it easy to fit 20mins in at least three times a week. Your program was exactly what I needed: quick, easy, transportable, guided, able to be done at any time of the day or night, repeatable; in fact it gives me no excuse not to do it and it’s great having a timeline and your check-in emails. I really have been surprised by how seemingly little effort has made such noticeable changes. I recommend it to everyone I know. 8 Months Post-Concussion, I failed 4 balance tests while at an appointment with my Functional Neurologist. After only 6 weeks of DRT1, not only did I pass those same tests, I exceeded standard norms! Nicola’s fitness program focuses on improving balance, flexibility and strength with detailed instruction on innovative exercises and stretches. The objective was to improve my riding skills, but the program improved my life! Thank you, Thank you, Thank you for your amazing program and being your awesome self! I was struggling getting back to riding after a year off due to major abdominal surgery. Your program helped get me not only back on track physically but also helped with my headspace and lack of confidence. 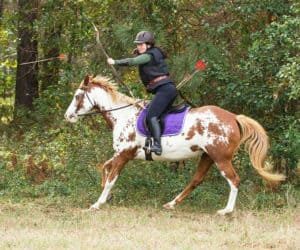 I do hunter/jumper and also compete in mounted archery competitions and this program was vital in getting me back up to snuff with both. My seat is more independent, my legs and core are stronger and I’m able to do things I wasn’t able to about 6 months ago. I’m looking forward to trying DRT 2. I enjoyed DRT2 as much as DRT1. I do it because not only I feel a bit stronger when I’m sitting on a horse but also I feel so good after I finish the exercise! I want to be more stronger, flexible and balanced! Thank you very much. 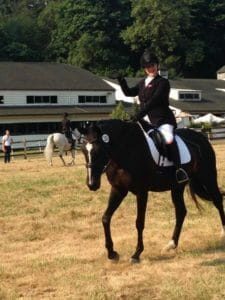 Hi Nicola, Thank you so much for providing these Dressage Rider Training 1 and 2 opportunities for us! I have loved the variety of exercises, and the changing emphases on core, yoga, and strength. I also love that all of it is designed to help us in the saddle! I also appreciate the different levels of intensity that we can use for many of the moves, to accommodate a wide range of capabilities and agility. Some of us aren’t in our 20’s anymore and aren’t quite as flexible as we once were, yet you keep everything positive and energized to keep us improving at whatever level we find ourselves, and whatever our goals! 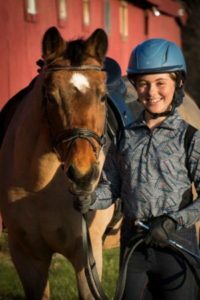 I would recommend these programs to anyone interested in improving their riding skills and their fitness! Thank you so much for offering these classes for us! 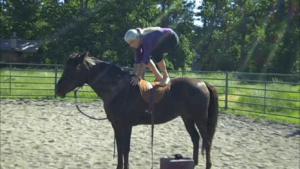 I took up English riding for the first time at age 49… I definitely appreciate any and all opportunities to improve my strength and balance that I can find! Nicola, thank you so much for making this program available! 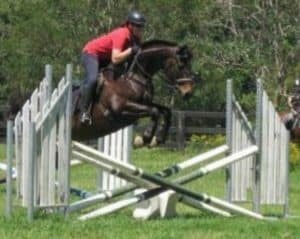 I am a jumper rider with my current horse (show name Zen Rose, barn name Faith). 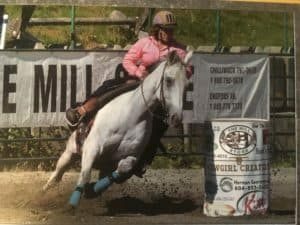 I strongly believe that solid ground work and cross training for the rider are critical to jumping success and have always been willing to put time into both. Faith was injured last year so I have spent most of this year doing ground work with her to allow her injury to heal. 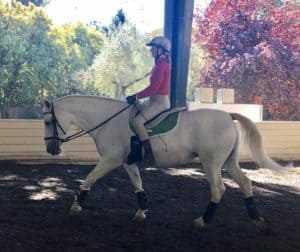 The homework provided with this program along with the ground exercises for the rider were ideal for keeping our work from being routine and dull and challenged me to do more than the usual amount of no stirrup work. I found your explanations of how to position the body on the ground and on the horse to be the clearest I have experienced. I could tell quickly from Faith’s response when I “got it”. 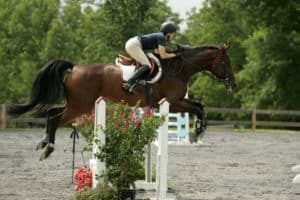 All of the rider exercises were ones I had done in various fitness programs but your selections ad explanations helped me better understand how they could affect my riding. My trainer is much happier with my flat work now. I look forward to continuing to use the videos to continue to improve my position, extending it to jumping as Faith recovers. I have now completed DRT1 & DRT2 and can’t recommend it enough for anyone wishing to improve their core strength, balance, and coordination. When I started DRT1 I wasn’t able to sit on the Swiss ball without toppling to one side let alone kneel on it with a 3kg dumbbell and move my arms – 6 months on and I can balance on the ball and swing my arms holding a weight! I especially loved the Yoga workouts and tried to do them at least 5 times a week. Being someone who tends to hold their breath when riding or when feeling stressed, the yoga workouts were a real treat and made me feel relaxed and refreshed afterwards. At the start of DRT1 I also hadn’t done much non-stirrup work for fear of collapsing to one side and being dumped should my horse throw in a playful spook! Halfway through DRT2 I was confident enough to ditch the stirrups and was amazed at how still and balanced I felt in all 3 gaits! If you’re not sure whether DRT1 or DRT2 is for you then I would recommend you invest your time and money and give it a try, you won’t be disappointed. 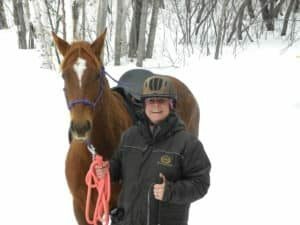 DRT enabled me to stay fit enough to catch a ride in two recent clinics while my horse is rehabbing–I have only ridden occasionally for the last three months. 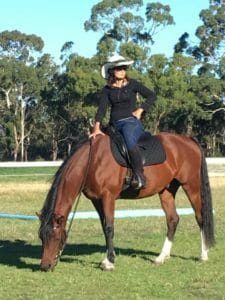 I am so looking forward to getting back on my horse, I am significantly more balanced in my own body and learning to ride with my spine in neutral has allowed much great freedom in my shoulders, hips, and upper legs. I have attached pictures from the first clinic, one because it is a wonderful picture of my friend’s Lipizzaner mare and the other because it shows the most neutral spine I’ve every had. I sit in front of a computer all day for very long days and keeping my core and upper back in alignment and strong is a significant challenge. The DRT1 exercises were a great start, but I didn’t really start to see improvements until DRT2. Fitting it into 20 minutes was brilliant, I could almost always get myself to do 20 minutes of exercise at night. Thank you for the fabulous program! I am going to start DRT2 again from the beginning while I wait for DRT3 ? This pic was taken last week and my young gelding was great and our ride felt wonderful. I am just starting to take him out and about. 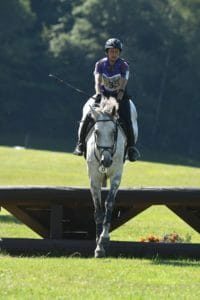 There were a few young horse antics first time I took him out on a cross country equestrian centre, but I felt so confident to handle it because of DRT. I am looking a lot more fitter and athletic and feeling fantastic! My seat feels so much deeper. I am 61 years old and enjoying life. Loved the program. Love your Positive energy!!! You have a wonderful friendly manner about how you present things. There is a great deal of very good stuff in the program! Very good stuff! Thank you for all your work on this program Nicola! Great idea and very much appreciated! DRT has been great. It’s challenging at times but worth the effort. I’m very glad I purchased the program! As an older rider (age 51), I had underestimated how much my general stiffness and lack of mobility was affecting my riding my results. The stretching routines and homework assignments that are part of the DRT program have made a huge difference in my riding… and now, not only can I actually pinpoint what part of my body is tight and the challenges it’s creating in the saddle, I have recommendations from DRT on how to create more flexibility in that part of my body. I definitely feel very different in the saddle after starting this program.